Today's grandma and grandpa are providing a lot of the child care and financial support for grandkids, new studies say. Here are the latest grandparent stats. Nanas and granddaddies of today are providing an increasing level of financial and day-care support to their grandchildren, according to a USA Today report. The article suggests the driving force behind the bigger presence is the effort to help their children save money and "to build stronger family connections." 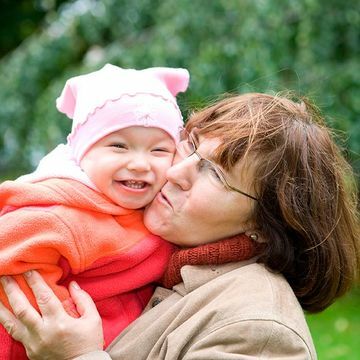 A University of Chicago study of 13,614 grandparents found that 61 percent of them provided at least 50 hours of care for grandchildren for one year; 70 percent provided care for two years or more. A MetLife-Generations United study found that 74 percent provide day care weekly, and 62 percent have provided financial support to grandchildren. Since Sept. 9, 1979, Grandparents Day has been celebrated every year in honor of our nation's grandparents with whom 1 in 10 of all children in the U.S. live, the Census Bureau reports. The Census notes that 7.5 million children in the U.S. were living with a grandparent in 2010. Previous studies have revealed that grandparents are the safest choice for child care, finding that children get fewer boo-boos under grandma's or grandpa's watch. Although the image of the all-knowing, all-giving grandparent persists as a growing trend, remember that "perfect" grandparents remain largely a myth for some families. If your parents or your in-laws are not as involved but your children are lucky to have them in their lives, check out our Grand, Yes. Pefect, No page for tips on how to make interactions easier in your relationship.